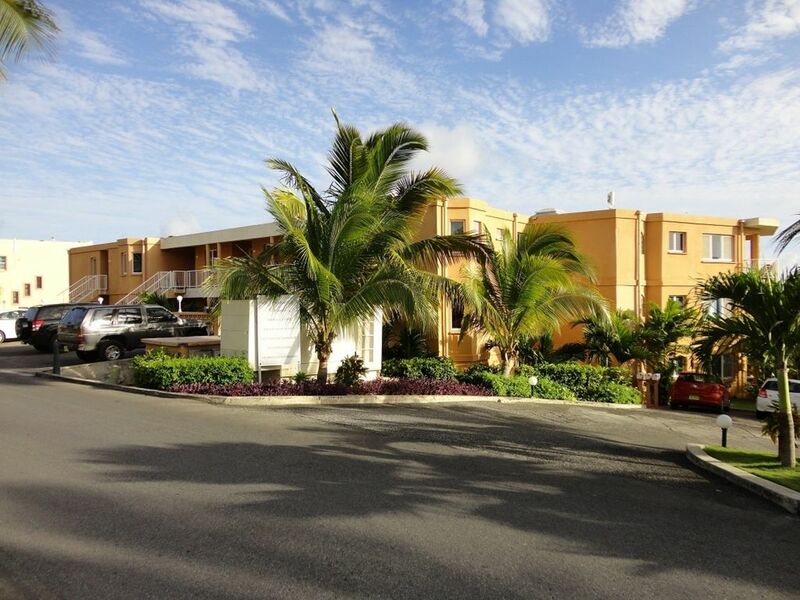 St. Maarten, Pelican Key Near The Beach, 2 Bedrooms, Roomy And Comfortable. 1300 sq foot, pleasant and comfortable. The unit has central A/C as well as individual AC units for each bedroom. Fully equipped kitchen with modern appliances and a full washer-drier unit, a balcony and a parking spot. The neighborhood is quiet and safe, but just lively enough. We have great neighbors and you won't find a flood of tourists around you. However, if you want to mingle with tourists there are several hotels and resorts a short walk away, all with public access beaches. There are always taxis on standby at the nearby Flamingo resort. Several restaurants are within a several minute walking distance. I prefer the 15 minute walk to Simpson Bay, which offers varied dining, nightlife and entertainment options. The unit comes with a parking spot and a rental car is highly recommended if one wants to explore the island. Public transportation is also an option off the main Welfare Rd down the hill. My name is Tim and I'm from Toronto. This is my families vacation house and I absolutely love coming down to St Maarten to relax and get away from the big city. The location cant be beat and I enjoy snorkeling near the rocks which are a few minutes walk from the condo. Pleasant, inviting and comfortable. Have breakfast on the balcony and enjoy the Caribbean mornings. Our balcony sits 3-4 people and has chairs and a table, with a partial view of the ocean. Nice neighborhood, good location, very nice condo & pool! We felt safe and thought it was a very nice location. The use of LaVista's 2 pools, decks, and chairs was wonderful-great ocean views from both. We never used the bar/restaurant but can't imagine it would be anything but good! Condo was well equipped with everything one needs for a beachside vacation. The furniture was comfortable, the bed was great! Plenty of room to cook and live in. (2 bdrms/bath...plenty of room for 4, but there was just 2 of us) Washer/dryer came in handy. Dishwasher too but we never used it. Nice but small deck with a bit of an ocean view and morning sun. There was an umbrella, 2 chairs, a matt, & toys for the beach. There was even a few spices, coffee, filters and tea to get you started. We never found out if the water was safe to drink, so we bought bottled water. We had a couple small problems which Tim had fixed as soon as possible. The clean towels are stacked willy nilly on a shelf in the master bedroom which kind of bugged us and only 2 beach towels. The screen door to the patio fell off when we went to open it and the repair was to mount it solid on the other side, so we couldn't use it. IF it were buggy this could be a big problem, but it wasn't buggy at all. The rail on the master shower door really needs cleaned and the rollers need fixed. Many lights do not work, not sure if it is a wiring issue or burned out bulbs. Only 1 roll toilet paper in each bathroom. ***We highly recommend a car as most things are a bit far to walk to! Taxi's never seemed plentiful near the condo either. The other thing we recommend is the grocery store on Welfare Rd right where it turns to Billy Folly Road. I believe it's called Market Square. (Next to Burger King) It is close, clean, reasonably priced and a great selection. Have patience.....traffic is utterly slow and always backed up! A lot of the island is not recovered from hurricane Irma. Tim was a GREAT host and we hope to return! Had s great time . Nice place, not much of a view but did have a balcony . Nice pool and view nearby. Upon return. Quiet area. Good tv reception and internet. Very centrally located. We had a rental car and highly recommend it. Located right near the beach in the Pelican Key neighborhood, on the calm and clear Caribbean side, within walking distance of Simpson bay bars and restaurants.